Whether you’re planning a romantic evening for two or a casual dinner, cook up a simple meal quickly and with minimum hassle. This dinner recipe book is full of recipes that will really whet your appetite. From appetizers to salads to main courses, we give you what you need to whip up something healthy and delicious for your next meal. 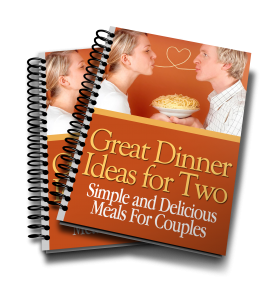 Start enjoying dinner again with ‘Great Dinner Ideas for Two’. Download your copy here.